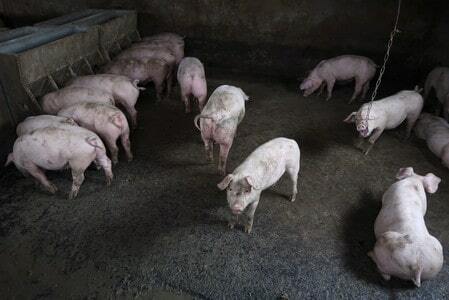 BEIJING (Reuters) – An outbreak of African swine fever in China is proving to be a windfall for chicken farmers, helping drive up prices of the country’s second-most popular meat to two-and-a-half year highs. The turnaround is a boon for farmers in the world’s top poultry producer after tepid demand growth in recent years following a series of food safety and bird flu scares. Broiler prices in top producing region Shandong hit 9.7 yuan ($1.41) per kilogram earlier this month, their highest since March 2016. The moves have tightened supply in the populous south, leading to soaring prices just as demand rises ahead of a week-long holiday in October. Chicken is a cheaper substitute for pork and prices typically rise when pork prices increase. Some cuts like chicken breast bones, used in school and work canteens, are already at record highs, according to Pan Chenjun, senior analyst at Rabobank. Anecdotal reports suggest some consumers are also worried about catching swine fever from infected pork, even though the disease cannot be passed to humans. Share prices jumped in August at companies including poultry producers Fujian Sunner Development Co. Ltd and Shandong Xiantan. Stock prices and broiler prices have eased somewhat this month as more chickens were sent to slaughterhouses ahead of the holiday period, said Alice Xuan, an analyst with Shanghai JC Intelligence Co. Ltd. This comes despite a shortage of breeding stock, that has already helped support chicken prices this year, analysts and industry participants said. Beijing’s anti-dumping tariffs on imports of chicken meat from Brazil, implemented in June, have also underpinned chicken prices in China. Average prices for chicken meat product reached 11.15 yuan per kg in early September, up 13.2 percent on the year, according to Boyar, an agribusiness consultancy.